JAMMU, Sept 7: A woman from Chattisgarh was injured today due to stove blast in Gajansoo area of city outskirts. “Sahil Kumari (38) wife of Santosh Kumar, who was presently living at Gajansoo, received about 70% burn injuries due to stove blast at her residence”, a police official said. 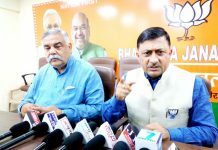 He said the injured woman was shifted to Government Medical College and Hospital, Jammu for treatment while the concerned police had taken cognizance of the matter.